Shirts With Random Triangles: Oklahoma State adds Texas JUCO defensive tackle Motekiai Maile to its 2015 recruiting class. Maile is graded a three-star athlete by 247Sports Composite. 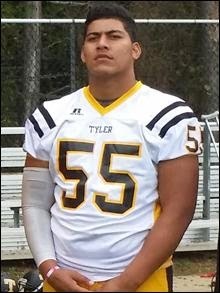 He is ranked seventh in the recruiting service's composite list of the top JUCO DT's in the country. Maile attends Tyler Junior College in Tyler, Tx. He stands 6'4", and weighs 300 pounds.